Just like the Deep Fried Oreos, I learnt about Churros on my favourite food show Carnival Eats. Since then I have been itching to try some. My brother is currently in Spain and I have been coaxing him daily to try Churros. I don’t know if he tried them yet but the very thought of Churros made me make some in my kitchen. Churros are essentially a Spanish – Mexican dessert popularly sold as street food. Outside these countries they are treated as a dessert and served with lip smacking dips or accompaniments. But the chocolate sauce happens to be its best pal. Churros is made using Choux Paste – a flour dough consisting of eggs which is extremely difficult to get right. When I found this eggless easy recipe of Churros here, I got excited and tried it the very next day. The Churros originated in Spain and then brought to Mexico by the colonists. There is a slight difference between the 2 versions (not sharing here due to ambiguity in reasons I found) but both are deep fried and look and taste the same. These are thick, 3 to 4 inch long strips of fried dough, coated with sugar and served with a sweet dip. They are always served warm and fresh; never fried and kept beforehand. ⇒Churros work great as a party snack or when friends get-together. ⇒The dough can be made in large quantity and frozen to be used as and when required. ⇒Try serving Churros with variety of sweet dips or sauce. ⇒You can also try flavouring the dough to have a burst of flavours in your mouth when you bite into this flaky goodness! Step 1 – Take water, sugar, salt and oil in a thick bottomed pan. Place over medium heat and bring it to a boil. Step 2 – Take off flame and add flour to the pan. Mix vigorously using a whisk, till everything comes together to form a ball. Step 3 – Take a piping bag and attach a star shaped nozzle to it. 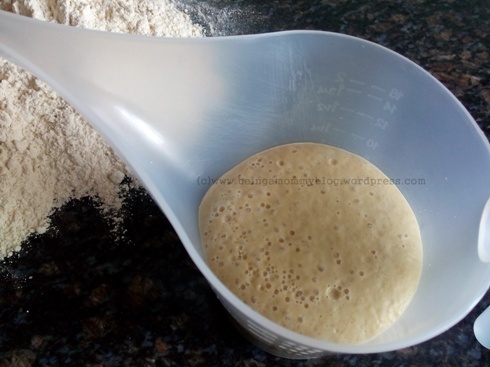 Step 4 – Put half of the flour mixture into the bag and test by piping some of the dough onto a plate. Step 5 – Heat oil, about 3 to 4 inches deep, in a wok / kadhai. Pipe out 3 inch long churros and fry over medium heat till they are crisp and light brown on the outside. Step 6 – Remove on an absorbent paper and slightly cool. Step 7 – In a bowl, mix powdered sugar and cinnamon powder well. Toss the churros lightly in the sugar- cinnamon mix. Pick each Churro, tap off extra coating and place on a serving plate. Serve immediately along with Chocolate Sauce. Love these crispy churros dipped into chocolate sauce. Absolutely a perfect party snack ! I love ethnic food and I love desserts, so this is certainly the best of both worlds. Yup it is 🙂 Thanks for dropping by.